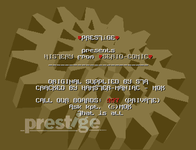 Prestige was an Amiga and PC ms-dos cracking group, formed in june of 1994 and active at least to 1996. 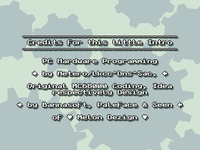 Originally an Amiga group, they seemingly made their last release on the Amiga in april of 1996. They started releasing cracks on the pc in february of 1996, gaining traction in may and ending in december that same year. The september 1994 cracktro for Kid Chaos contained a complete memberlist, listing Abh, Blackbird, Bomber Man, Candy Man, Deathknight, Enzo, Fletcher, Fury, Groo, HRD, King Cobra, Mark, Mok, Phantom, Polaris, Samir, Shark, Skol, The Freak, Troops, Troll, Waldo, Willy and Zion. The 1st of october released of Kid Chaos HD +16 revealed Abh, Candy Man, Devious Doze, Enzo, Fletcher, Fury, HRD, Phantom, Shark, The Freak and Waldo had disappeared from the memberlist in the short timespan since the last release. A new memberlist from december in the cracktro for Subwar 2050 AGA revealed Blackbird and King Cobra had disappeared from the list, while Candy Man was apparently back and Chaotic Descent, Hardrider, Hitman, Jabo, Jake, Mousebuster, Mr. Hyde, Nightshade!, Striker and The Wizard were all new since the september list. The early february 1995 release Whizz ECS listed Bomber Man, Chaotic Descent, Deathknight, Enzo, Fletcher, Fury, Groo, Hardrider, Hitman, Jabo, Jake, Mark, Mok, Mousebuster, Mr Hyde, Nightshade!, Polaris, Samir, Shark, Skol, Snake & Delboy, Striker, Stylemaster Dj, The Freak, Troops, Troll, Willy and Zion as members at that time, revealing The Wizard and Candy Man (again) had disappeared from the memberlist. Then the release of Whizz AGA on march 10th came with an nfo that included the text "A BIG welcome to PONTON & RAJ! to our family :))". The enclosed memberlist also revealed that Devious Doze, Leeroy and Shane had been added to the memberlist since early february. The june 1995 crack intro for Tower of Souls AGA had a new memberlist, and since we checked in in march Devil and Raven had appeared as new members. 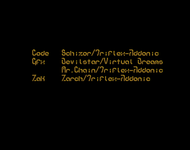 The mid july release Player Manager 2 ECS came with an nfo file, proclaiming "We Dedicate this release to NiGHTSHADE! who left the scene 2 weeks ago." 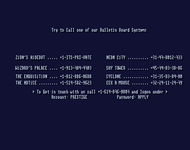 On the 3rd of august the group put out the text file PSG-BYE.TXT announcing their withdrawal from the scene, only to put out PSG-BACK.NFO on the 8th, announcing they were back again. 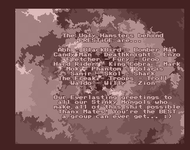 The august 1996 cracktro for Duke Nukem II listed Abacus, David & Goliath, Deathknight, Devilstar, Firefly, Hammer, Jabo, Jake, Phoenix, Snake & Delboy, Shadow Master, Speed Master, Tazman, Troll, The Chemist, Troops, Vaffel Killer and Zion as members at that time.